All this talk of VR and Sansar could lead you to believe i don’t do anything anymore in the biggest user created Virtual World. Following Fantasy Faire i’ve been slowly building up accessories for my Kid avatar range, built a new mega store and created BMX bikes. I scanned in some old shoes that seemed to be perfect for Second Life Kids and once i feel ready i plan to promote my Avatar range properly. Before that though i need to deal with the Escapades Island Issue. About a year ago i sat down with some of the Islands plot renters/owners and discussed possible ways to breath new life into the island. Nothing lasts for ever, everything marches on and old places need to be injected with fresh relevance. It’s coming up to Escapades Island’s 8th year of existence and if i’m truthful the Island has never been finished, never lived up to the original ideas proposed. There was plans for lots of Role-play groups, games and events but this in the end never really materialised. The island never reached the planned potential, partly due to how people use the island and partly because my own ideas were too big for the platform to meet. 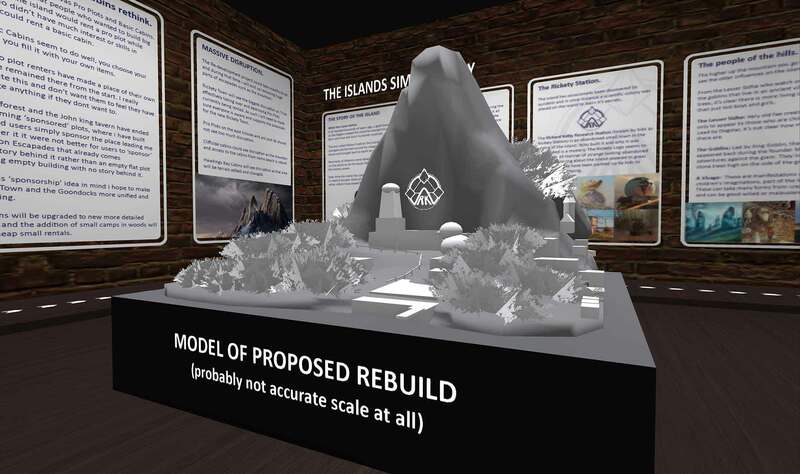 So with that in mind i proposed to rebuild parts of the island with the goal of giving the island a refreshing boost. 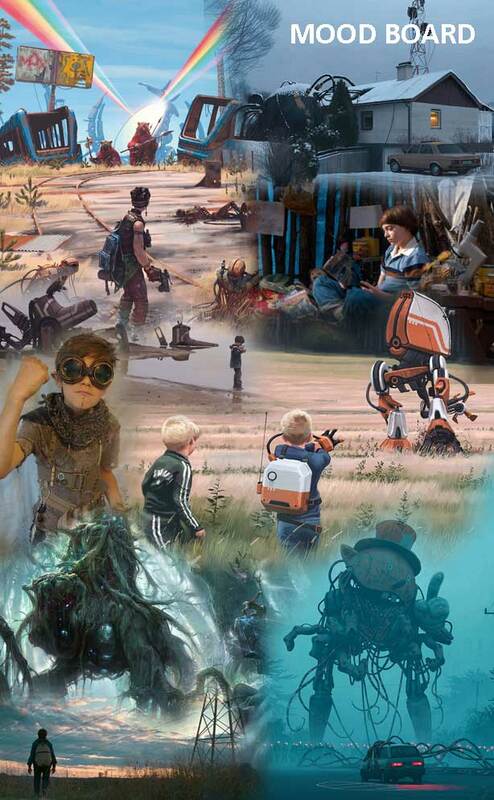 The idea is to rebuild around how we now know people are using Escapades Island with the hope of giving a better more story driven atmosphere of the island. Currently its a hotchpotch of different concepts that never fully reached completion. 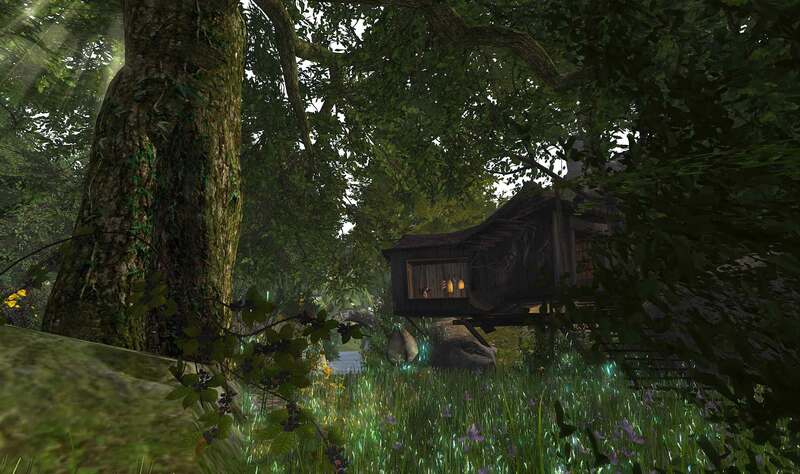 Pro Plots and Basic Cabins rethink. In the beginning there was Pro Plots and Basic Cabins. It was expected that people who wanted to build big projects on the island would rent a pro plot while those who didn’t have much interest or skills in building could rent a basic cabin much as they did on Goony Island. The Basic Cabins seem to do well, you choose your spot and you deck it out with your own items. I’ve watched people take great creative care in setting up their cabins spaces. Some pro plot renters have made a place of their own and have remained there from the start. i really appreciate this and don’t want them to change at all. The Fae forest and the John king tavern have ended up becoming ‘sponsored’ plots leading me to wonder it it were not better for users to ‘sponsor’ a place on escapes that already comes with a story behind it rather than an empty flat plot or boring empty building with now story behind it. Places of importance that will be re-developed. This was the original beach created back in the days of Goony Island. 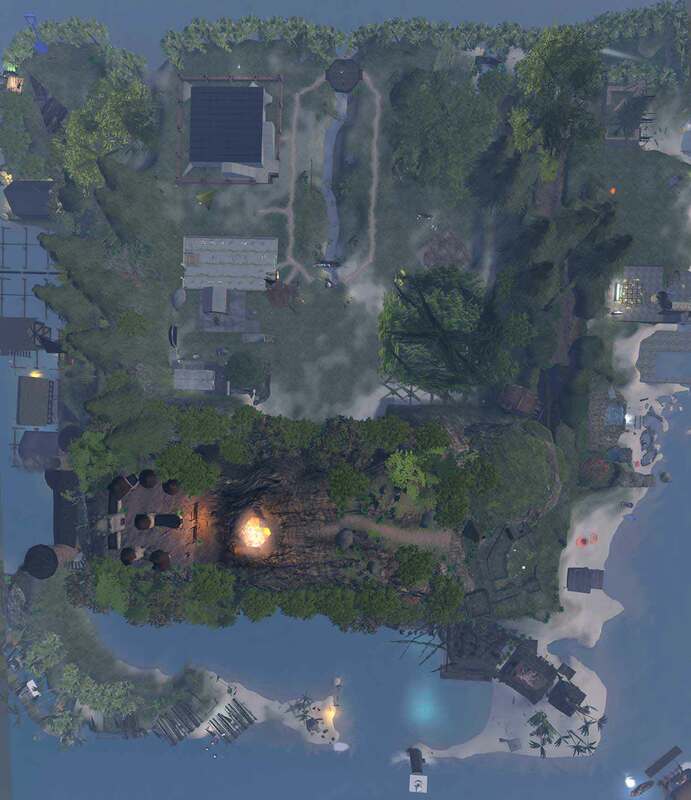 The shape of the beach hasn’t changed much , but i would like to expand it a bit more by removing the old Shop building and reduce the size of the clubhouse repurposing it as a small beach side shack. The Goony Clubhouse would be moved to Rickety Station to what is currently called the Town Hall where we have weekly meetings. The volcano mountain is the centre of the original mythology. Back when it was Goony Island, the islands were in a ring and there was stories of the Volcano exploding at some point. Then the not of time was re-tied and the island was transformed back to before the volcano exploded. The mountain was made hollow with he plan to place all sorts of fun inside it. This never happened and instead i discovered it was better to teleport people to cave systems elsewhere. So i would like to rebuild the mountain entirely and note have it hollowed out. The mountain would be bigger and more detailed with more nooks to explore. It might not even be a volcano any more and instead have something else to discover at its peak for when we burn the wicker man. As for the Inferno and bone organ, it’s possible to create a more atmospheric version of these secret places using the Experience Keys system to teleport explorers to rooms rather than having the mountain hollowed out. 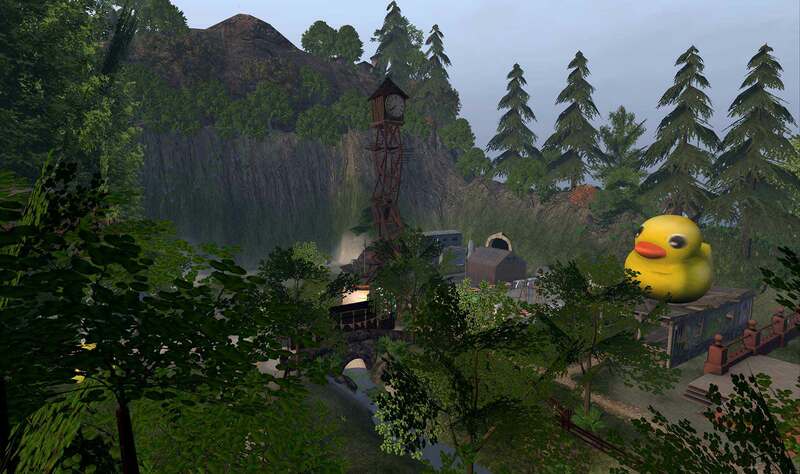 The Cliffside Cabins should remain as they are but the waterfall might receive a facelift. Originally envisioned as being a town of ‘Rickety’ market buildings, this area of the island really didn’t become anything like what was planned and was very hard to sell plots. What i would like to do here is turn the centre of the island into a small Spielberg style abandoned research town beside a road that curves up a hill. The places was mysteriously abandoned years ago. The buildings will have hidden spaces for users to set up a home, and bigger spaces to rent for shops if they wish. But the over all goal here is to bring a more unified atmosphere and mystery to the story of the island instead of the randomness that’s been there before. A fun little place to bash Goblins. One of the more atmospheric changes i’d like to do with Escapades is make it less high fantasy, so while King Goblin and his gang will still live on the island, their village will be completely rebuilt along with the Mountain. Instead of the huts and stone buildings , their village will have a more natural vibe, such as creepy stone Trees with symbols. For visitors this will ad a more mysterious perhaps darkness to the side of the mountain. Originally set up as a series of plots with remade pirate themed buildings they were always difficult to get rented. The original Escapades Concept was of different gangs on the island, one of which was a pirate gang but this idea of themed gangs never took hold. The only building there that was of use was the John King Tavern which still gets visitors today. I would like to update the john king experience with the modern XP tools. 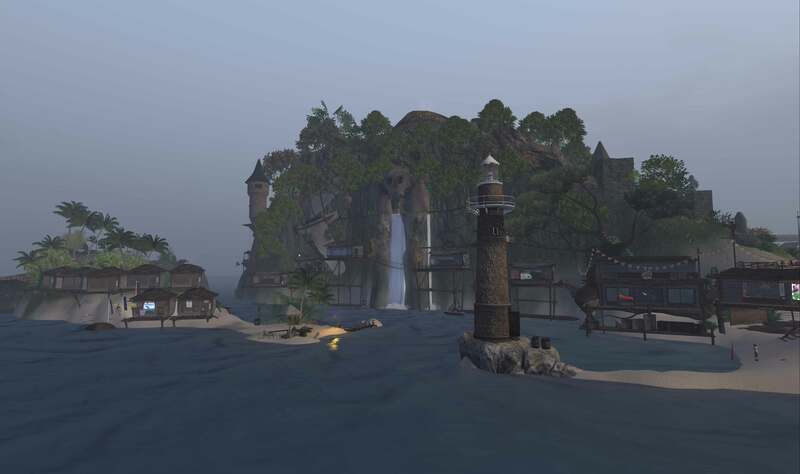 As for the Goondocks area, i am thinking of dropping the pirate theme but keeping the area as small abandoned dock. 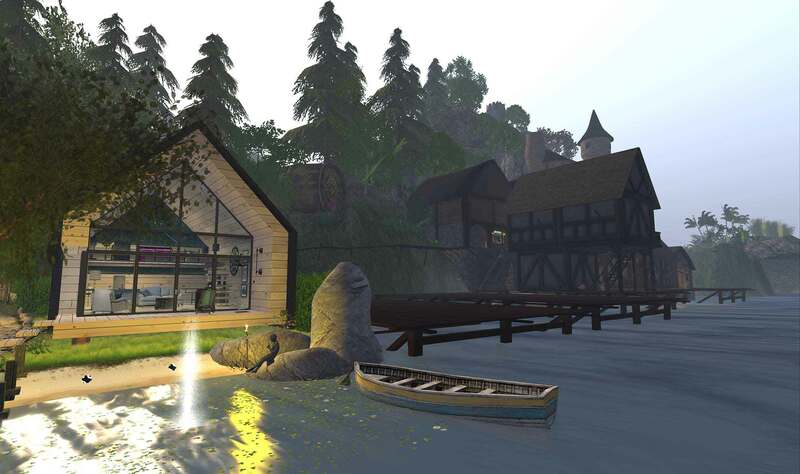 The Tavern would remain, but i would create a more picturesque cove with cabins and the odd sponsored building. One such building would lead to the sky pirates platform high in the sky and elaborate on the levitation crystals. The Meadow of contemplation, Cutterstone Gorge and Fae Forest. It would be nice to make all these areas seem more integrated. At the moment they all seem like plots next to each other. I would like to make the Fae forest seem more seamless and even expand up to Rickety Station. The Mine shaft that tunnels under the Cutterstone gorge could be filled in and have users teleported to an underground cave system that joins with other entrances on the mountain using XPtools. Originally the main village for all the Basic Cabins. It used to have a kids pirate fort on top until i ran out of prims and had to remove something fast. It still has the tunnel that lead from the fort down into the strange cave. I would like to rebuild the cave area to look more natural and maybe make Hawkins a more interesting place to live. back in the day there was all these plans for different gangs on the island, Timerascals, SeaPups, Darkagers and Tronics, each with a founders backstory and a themed area to live in. This was asking far to much of the Users so we’ll be simplifying the story of the island so everyone can just be who they wants and live where they want. It all started thousands of years ago, a god known as the Dagda created the island to conceal his earth born son from the harm humanity could do. The boy called Mabon lived on the island which changed and formed around his imagination until found and brought back to earth by a legendary King. Remnants of Mabons many adventures still remain on the island as do the lesser Sidhe who maintain the islands power. Over time the island has called out to other children in need of escape. Some of which stay for only a while, others have stayed for years never raging a day. Visitors to the Island can spend all day exploring the islands many secrets trying to work out what it all means. Those who stick around can try and make sense of it all by placing items to make it feel more like home. It can be a struggle for some to find clothes and food, building shelters either in the abandoned cabins or in other spaces dotted about the island. Some kids have become quite nomadic while others still retain their innocence living alongside the mysteries of the island. The island has occasionally been discovered by accident and in once instance a scientific colony was placed on the island to learn it’s secrets. The Richard Ketty Research Station (known by kids as Rickety Station) is an abandoned small town in the centre of the island. Who built it and why it was abandoned is a mystery. The Rickety Logo seems to appear on all manner of strange looking abandoned technology laying about the island covered in grass and moss. Mood Board of how i’d like Escapades to feel after the rebuild. A simplified set of tools will be developed for the Plot owners and Sponsors to allow them to easily create interactive objects on the island. These are all things i’ve already created so know are possible. Portal Kit: Allows you to create automatic teleportation between rooms so you can have secret rooms hidden high in the sky for visitors to find. Bashable Kit: Allowing you to create items that can be bashed open revealing gifts. Story Kit: Allows users to click and receive an auto attaching hud that tells information about you place, objects or even a story. Discord Server: For those who want expanded group features never added to Second Life’s limited group functions. The rebuild will start on Monday the 10th of September straight after this years 8th Anniversary weekend and you can go visit the presentation in Second Life to look at a large model of the proposed changes.